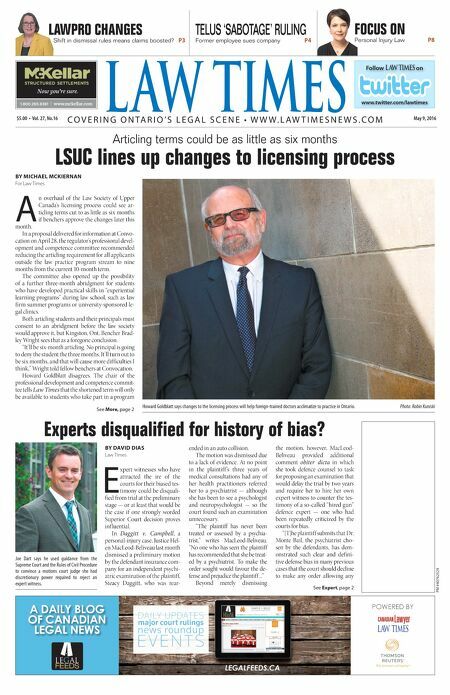 Experts disqualified for history of bias? BY DAVID DIAS Law Times E xpert witnesses who have attracted the ire of the courts for their biased tes- timony could be disquali- fied from trial at the preliminary stage — or at least that would be the case if one strongly worded Superior Court decision proves inf luential. In Daggitt v. Campbell, a personal-injury case, Justice Hel- en MacLeod-Beliveau last month dismissed a preliminary motion by the defendant insurance com- pany for an independent psychi- atric examination of the plaintiff, Steacy Daggitt, who was rear- ended in an auto collision. The motion was dismissed due to a lack of evidence. At no point in the plaintiff 's three years of medical consultations had any of her health practitioners referred her to a psychiatrist — although she has been to see a psychologist and neuropsychologist — so the court found such an examination unnecessary. "The plaintiff has never been treated or assessed by a psychia- trist," writes MacLeod-Beliveau. "No one who has seen the plaintiff has recommended that she be treat- ed by a psychiatrist. To make the order sought would favour the de- fense and prejudice the plaintiff ..." Beyond merely dismissing the motion, however, MacLeod- Beliveau provided additional comment obiter dicta in which she took defence counsel to task for proposing an examination that would delay the trial by two years and require her to hire her own expert witness to counter the tes- timony of a so-called "hired gun" defence expert — one who had been repeatedly criticized by the courts for bias. "[T]he plaintiff submits that Dr. Monte Bail, the psychiatrist cho- sen by the defendants, has dem- onstrated such clear and defini- tive defense bias in many previous cases that the court should decline to make any order allowing any Articling terms could be as little as six months LSUC lines up changes to licensing process BY MICHAEL MCKIERNAN For Law Times A n overhaul of the Law Society of Upper Canada's licensing process could see ar- ticling terms cut to as little as six months if benchers approve the changes later this month. In a proposal delivered for information at Convo- cation on April 28, the regulator's professional devel- opment and competence committee recommended reducing the articling requirement for all applicants outside the law practice program stream to nine months from the current 10-month term. The committee also opened up the possibility of a further three-month abridgment for students who have developed practical skills in "experiential learning programs" during law school, such as law firm summer programs or university-sponsored le- gal clinics. Both articling students and their principals must consent to an abridgment before the law society would approve it, but Kingston, Ont. Bencher Brad- ley Wright sees that as a foregone conclusion. "It'll be six-month articling. No principal is going to deny the student the three months. It'll turn out to be six months, and that will cause more difficulties I think," Wright told fellow benchers at Convocation. Howard Goldblatt disagrees. The chair of the professional development and competence commit- tee tells Law Times that the shortened term will only be available to students who take part in a program LAWPRO CHANGES Shift in dismissal rules means claims boosted? P3 TELUS 'SABOTAGE' RULING Former employee sues company P4 FOCUS ON Personal Injury Law P8 See Expert, page 2 See More, page 2 PM #40762529 $5.00 • Vol. 27, No.16 May 9, 2016 L AW TIMES & $#&!&jmmm$cYa[bbWh$Yec ntitled-4 1 12-03-20 10:44 AM C O V E R I N G O N T A R I O ' S L E G A L S C E N E • W W W . L A W T I M E S N E W S . C O M Follow LAW TIMES on www.twitter.com/lawtimes Howard Goldblatt says changes to the licensing process will help foreign-trained doctors acclimatize to practice in Ontario. Photo: Robin Kuniski A DAILY BLOG OF CANADIAN LEGAL NEWS LEGALFEEDS.CA FEEDS LEGAL POWERED BY Untitled-3 1 2016-04-27 3:46 PM Joe Dart says he used guidance from the Supreme Court and the Rules of Civil Procedure to convince a motions court judge she had discretionary power required to reject an expert witness.